THE PILLOW BOOK OF THE FLOWER SAMURAI is set in Japan in the Heian Period (794-1185). The Gempei War, the cataclysmic clash between the Taira and Minamoto clans in late twelfth century Japan, heralded the end of the region’s Golden Age (794-1185). At this critical time in Japan’s history, samurai continued their progression to power until they, not the Emperor, controlled the country. Many Noh and Kabuki plays are set during this war because of the war’s innumerable heroic exploits and battles. These plays are written from the Minamoto point of view, but the point of the view of THE PILLOW BOOK OF THE FLOWER SAMURAI is the Taira’s. Noble women, and also peasants, often travelled on pilgrimages and wrote a “journal.” The women stored these journals near their pillows,actually in their wooden pillows, hence the name. After a journal entry, a poem or two often followed. THE PILLOW BOOK OF THE FLOWER SAMURAI emulates this custom. For more reading, The Tale of The Lady Ochikubo, The Pillow Book of Sei Shōnagon and As I Crossed a Bridge of Dreams are some of the translated pillow books from the tenth and eleventh centuries, although, none of these women is a samurai, like Kozaishō in THE PILLOW BOOK OF THE FLOWER SAMURAI. Rather than weeks, the days continue cycling through the twelve divisions: Rat, Ox, Tiger, etc. Days are delineated as the Third Month, Second Day of the Rabbit, or Fourth Month, First Day of the Monkey, etc. For people, the animal of the birth year, the elements (Wood, Fire, Earth, Metal and Water) and the alternating principles of yang (masculine/positive) and yin (feminine/negative) combined to create multifaceted personality configurations. Therefore each year included three different ‘wheels’ of features: animal, element and yang/yin. Please note that men are not inevitably yang, nor are women unavoidably yin. Yang and yin represent personality types, rather than gender. In THE PILLOW BOOK OF THE FLOWER SAMURAI, I simplified to the element and yang/yin to avoid digressing into personality types and detracting from the story. For example, Kozaishō is a Fire and yang personality. She is a leader, promoter who is determined, zealous and always looking for something new. Misuki is Water and yin, a bubbly personality. She is also receptive, easy-going, philosophical, superficial and passionate. Hitomi is Metal and yang, a good motivator who can succeed in almost any profession. Akio and Tashiko are Earth, the former yang and the latter, yin. The Metal yang is ready to fight for truth and righteousness. The Metal yin is liked by others, strong yet compliant, gentle yet confident and tolerant. Japanese adopted Buddhism in the sixth century, while gradually integrating their Shinto beliefs. For centuries, Buddhism was the religion of the aristocrats. Kozaishō as the daughter of a cultivator, originally held Shinto beliefs. Part of this belief system included clapping to dispel evil spirits and a strong sense of ritual cleanliness, which Buddhism absorbed. Part of ritual cleanliness included, for example, ritual defilements such as menstruation and death. The washing of hands and rinsing the mouths before entering sacred areas is a Shinto concept. Each temple and shrine associated itself with a particular sect of Buddhism or Shintoism and could be sponsored by political figures (head of a clan, Emperor, Prince). Each maintained its own military force, sōhei, and was mostly tax exempt. The political, religious, social and military lines crisscrossed repeatedly, particularly in the latter Heian Period, the time of THE PILLOW BOOK OF THE FLOWER SAMURAI. None of the Judaic-Christian-Islamic influences had entered Heian Japan. Virginity, at least among the aristocrats, was not a state to be desired in men or women. Moreover, adult virgins were considered suspicious and possibly corrupt or dangerous. Non-royal aristocratic marriages involved a man staying three nights in a row with his ‘intended’. If he did not return after the first or second night, they were not married and each moved on. Children of such unions were simply acknowledged and accepted. Polygamy functioned contrarily than commonly assumed in current times. When a man married, he moved in with his wife. Women generally inherited their parents’ homes and property. (Court cases exist of widows suing for their property and winning.) Polygamous men travelled from household to household, i.e. wife to wife. However, Rokuhara reversed this by having a wife (or wives) living in her (or their) husband’s home. Aristocratic women customarily did not show their faces to any men other than their husbands and families. The curtained platform used for this was the kichō (servants did not count.) Ironically among the aristocrats, according to diaries and Tale of the Genji, a man might sleep with someone he had never seen. While married women of the samurai were expected to be faithful, divorce was common, easy and frequently initiated by women and men alike. 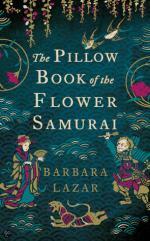 Read about THE PILLOW BOOK OF THE FLOWER SAMURAI and an excerpt of the book.